Amazon.com has never been at CES in a formal capacity. After all, until recently it was only its line of Kindle readers that it could display as its own product. The same was true at this year’s convention. However, in what was a surprise to almost everyone, there were multiple announcements from third-party vendors of Alexa’s inclusion in their products. This included products that have Alexa built in or have integrations to Alexa. 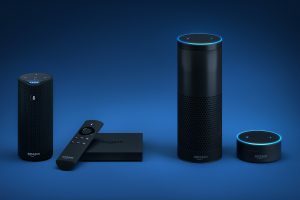 Here is a list of some of the product announcements where Alexa will be built in. Westinghouse, Element and Seiki are TV manufacturers that will be using the Fire TV software. The Fire TV OS has built-in support for Alexa. LG has included Alexa into Hub, its smart home robot along with Alexa in its new refrigerator, which comes with a giant 29-inch touchscreen. Lenovo’s Smart Assistant is basically its version of the Amazon Echo and even looks somewhat similar. Amaker announced a portable speaker with Alexa. This is probably bound to be the first of many. Onvocal neck buds will also come with Alexa. Although they do look rather strange and come across more as a concept than a final product. Ford is putting Alexa in its Fusions and F-150s. These are the first cars that will have any voice assistant built-in. Volkswagen also said that they will be doing the same. Other devices with Alexa built-in are a five device charging dock with a speaker, a dancing robot, an alarm clock, a “bedside clock speaker”.